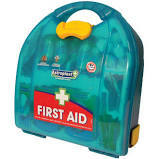 HSE Compliant First Aid Kit. Suitable for 1 – 10 persons. Also available 11 – 20 persons and 21 – 50 persons.